Farming of finfish, shellfish and plants in fresh and saltwater is the fastest-growing food production sector in the world and it's growing in Maine, too. From 2007 to 2014, the total economic impact of aquaculture in Maine—including sales revenue, full- and part-time jobs and labor income—nearly tripled from $50 million to $137 million. In 2014 alone, aquaculture businesses in the state reported $73 million in sales revenue. That's according to a new survey done by the University of Maine Aquaculture Research Institute, in partnership with the Maine Aquaculture Innovation Center, Maine Aquaculture Association and the UMaine School of Economics to assess the economic impact of aquaculture in the state. A total of 71 of the approximately 107 aquaculture businesses responded to the 2015 Maine Aquaculture Economic Impact Survey. The industry in the state employs 1,078 people, with 70 percent of those employed in year-round, full-time positions, according to the survey. 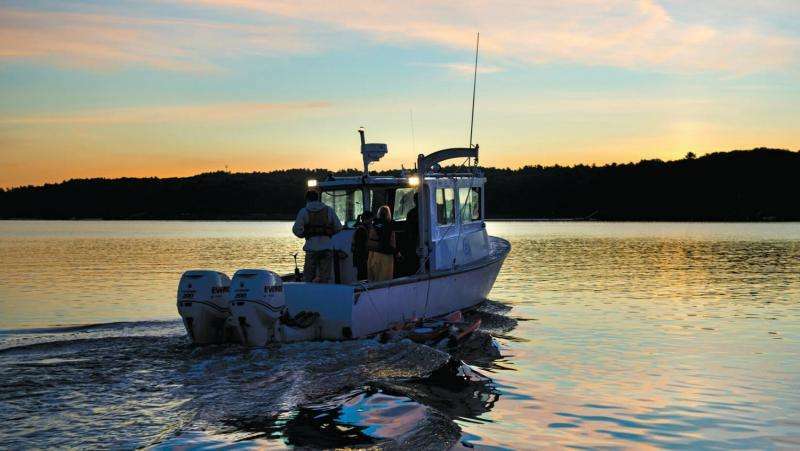 "This report highlights the often underestimated economic impact of the aquaculture sector to Maine, and illustrates the recent growth of this sector," says Chris Davis, executive director of the Maine Aquaculture Innovation Center (MAIC). Prospects for area aquaculture farmers to help supply the country with seafood are promising, as the U.S. imports 91 percent of its seafood, according to the National Marine Fisheries Service. Maine's coastline and marine resources represent unique assets and aquaculture business owners expressed optimism about opportunities to grow—73 percent of respondents predicted as much as a 51 percent increase in sales revenue by 2020. For a considerable percentage of respondents, aquaculture is a relatively young enterprise. Forty-five percent of the respondents indicated they had been in business since 2009—24 percent began operations in 2012 or later and another 21 percent began operations between 2009 and 2011. Fourteen percent had been in business 21 or more years. Respondents reported that in 2014, the top three selling aquaculture species were Atlantic salmon, blue mussels and Eastern oysters. For more than 40 years, the University of Maine has provided educational opportunities and conducted research related to aquaculture, at both the UMaine campus in Orono and at the Darling Marine Center, the university's marine laboratory in Walpole. And in 2014, the National Science Foundation awarded its largest-ever aquaculture research grant to UMaine and its partners. The purpose of the five-year, $20 million award was to expand Maine's research capacity across institutions and disciplines. It led to the creation of SEANET, the Sustainable Ecological Aquaculture Network. "The university anticipates that the outcomes, impacts and new capacity that emerges from the SEANET project will be integrated in the Aquaculture Research Institute's work plan and that this network of researchers and educators will help establish Maine as a leader in the science and education needed to build long-term sustainability in this important food system," says Paul Anderson, SEANET research network director and ARI director. In 1988, the Maine Legislature established the Maine Aquaculture Innovation Center to assist with developing economically and environmentally sustainable aquaculture opportunities in the state. MAIC supports 20 ongoing research projects and manages two incubation facilities dedicated to aquaculture based at the University of Maine Center for Cooperative Aquaculture Research in Franklin and at the Darling Marine Center. Offshore solar updraft towers offer perfect locations for aquaculture.